‘Bocking 14’ comfrey. I use it as living mulch between plants. For instance, the bright red is a young sourwood tree (Oxydendron arboreum). Comfrey has a very good spread to crown ratio as I call it, the crown only taking a few inches of space, the spread covering two feet or more. This, and the roots delving deep in the ground leaving the upper soil alone, lets other plants grow right next to it without competition, and lots of ground cover. It’s standard in my food forest that every tree has its companion comfrey or two (or three). Most have three around them in a triangle to keep the guild mulched with living and decaying leaves. I use this same technique of triangulating comfrey for asparagus too. Asparagus having such a feathery leaf, it doesn’t shade the ground very well, but its fast growing shoots can easily clear comfrey leaves in spring. In fact such shade elongates them and keeps them more tender. A peach with three “Bocking 16” comfrey around it. Between these is chocolate mint. Be careful if digging around comfrey. The roots spread before going deep such that within a foot circle four to six inches deep there’s a good chance of cutting the roots, making new plants. 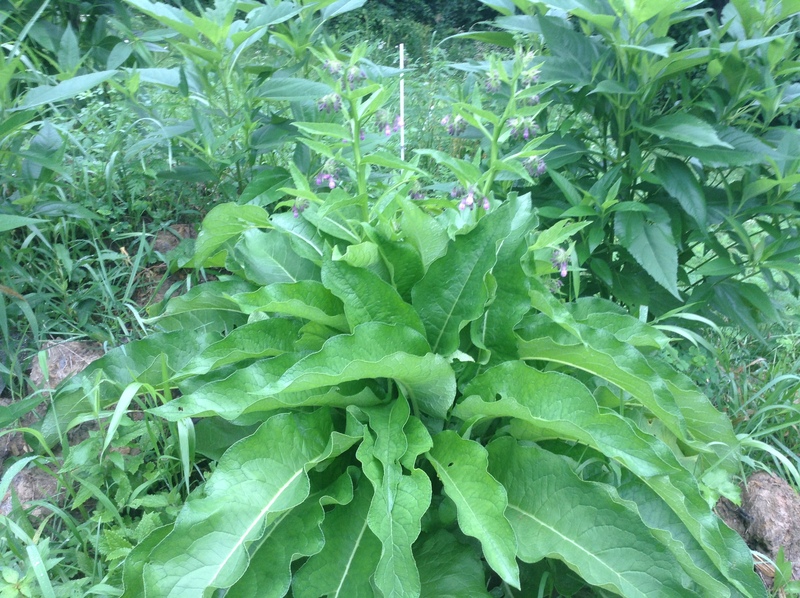 Comfrey is indestructible once established, so randomly making new plants can be hazardous. A more controlled way to use this attribute is placing a pot-bound comfrey where you want a new plant. Once it’s sat there for a month, you can move the pot, breaking off the roots that have grown in the ground, and more likely than not a new plant will grow there. Another propagative problem with comfrey is its seed. Only the true species, Symphytum officionalis, is really a problem. So if you have any, pay extra attention to keep them cut. If you don’t, I’d recommend you skip them, or keep them in the minority of your comfrey population, in spots you can keep an eye on. Russian comfrey, a cross between S. officionalis and S. uplandicum (or asperum depending on who you ask) is for all practical purposes sterile, and far more interested in leaf growth. 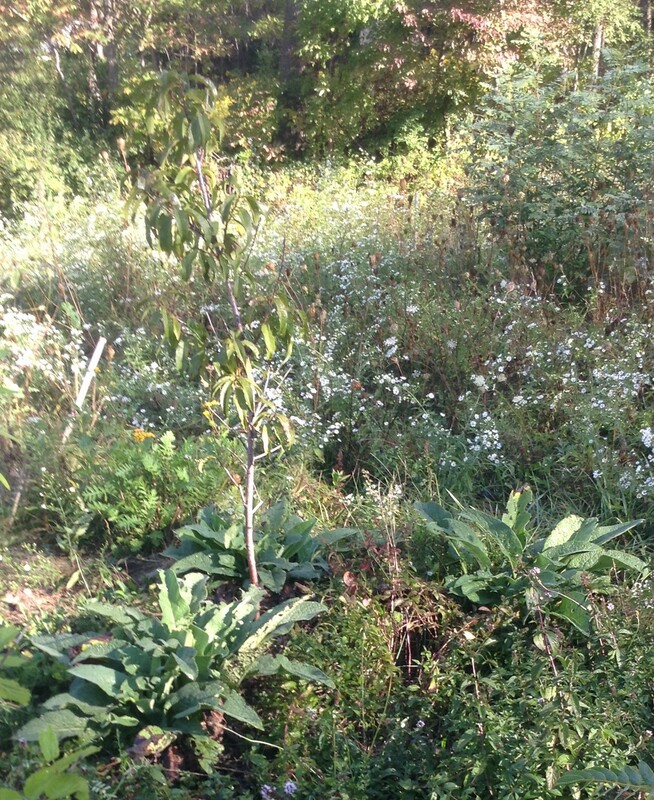 The Bocking 14 cultivar is one of the largest –four feet high by four feet tall in the willow garden –two feet by two feet in the food forest. As suggested by the number fourteen, there were other hybrid comfreys –and the breeding wasn’t done by Russians either. S. uplandicum’s common name is Russian comfrey, hence the name. The cultivars are “Bocking” because the breeding was done by Lawrence D Hills at the Doubleday Research Center in Bocking near Braintree, UK. Twenty one hybrids, I’m told, came out of the program, it seems Bocking 14 and to a lesser extent Bocking 4 are the only ones still in circulation. All a bit hagard with fall, but still good representatives, true comfrey is at left, Bocking 14 at right and S. ibericum “Goldsmith” in the middle. I do have a smaller Russian comfrey that I dug up from a friend’s yard. They were growing in a bank of almost pure coal and shade of bamboo for nearly thirty years, so I guessed they were stunted. After growing many cuttings in healthy situations, they’re just smaller and have a lighter pink flower. Another friend brought me a specimen of a similar comfrey he said was quite old. From what information I can turn up, I’d guess these are Bocking 16. Unfortunately I haven’t been able to verify this yet, but if anyone knows a place I could find out let me know. ‘Axminster Gold ‘ is a variegated form of Russian comfrey if you want to get fancy. It’s definitely on my want list. There’s an especially nice picture of it here. S. ibericum has a variety called ‘Goldsmith’ that is very small, only about 3 inches tall in leaf growth. The species is known for having more shallow roots and spreading to form a carpet, so it works differently than the other comfreys as ground cover. I’ve had it next to low growing strawberries and it didn’t seem to compete though. It’s overall rather weak, and can be ripped out and transplanted without the missed roots sprouting. Companion Plants carries S. grandiflorum, which is considered synonymous with S. Ibericum. It has yellow flowers and the same spreading, low growing habit. I’m trying to propagate the one I got from them this spring. Then there are smaller forms of S. officionalis. I’m just starting to experiment with them myself and haven’t seen how well the one from Companion Plants seeds. So far it is smaller than the true, and looks more like a Bocking variant. I’ll let you know how it shapes up. Companion Plants’ smaller S. officionalis. There are several other colors of comfrey out there. These mentioned cover the basic form and functions comfrey has to offer as far as ground cover is concerned. It’s just another function of that wonderful plant, comfrey. Next:the garden going it alone …..